Led by Paige Bueckers and Dlayla Chakolis, the Royals cruised to a commanding win and turn to state title rematch. 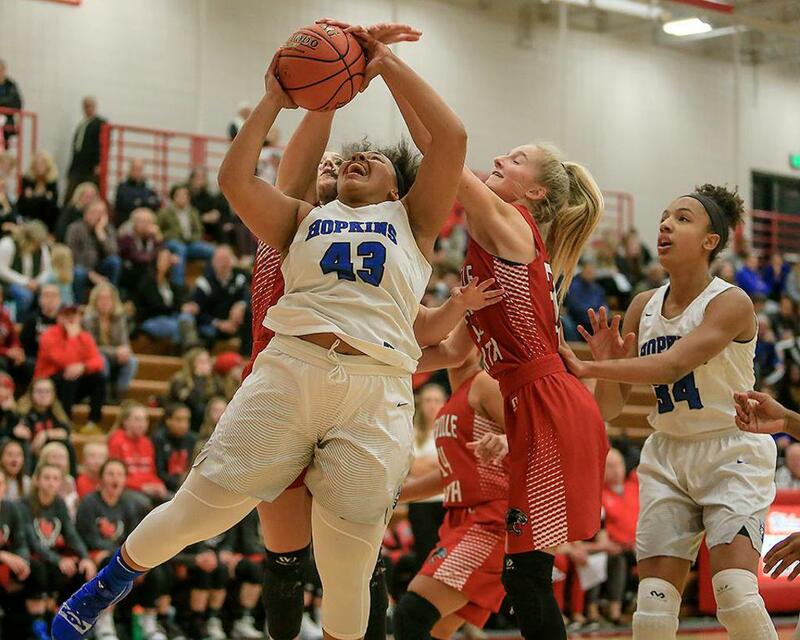 If a loaded week's schedule with matchups against two of last year's state tournament teams gives Hopkins any jitters, they did not show it Tuesday at Lakeville North. The Royals started the week with an 83-41 victory against the Panthers, who finished third in last year's state tournament. Their upcoming schedule includes a Saturday tilt against reigning Class 4A state champion Eastview at the Hopkins-hosted Minnesota Girls' Basketball Tip-Off Classic. And while the Royals want to win now, especially in potential state tournament previews, they know the most important games will be played at the end of the year. "I think it's excellent," Hopkins coach Brian Cosgriff said about the challenging schedule. "It lets people know where we're at, and it's only going to make us better. Because it's all about March." On Tuesday, last year's Star Tribune Metro Player of the Year Paige Bueckers led Hopkins with 26 points and seven rebounds. Teammate and senior Dlayla Chakolis also scored 22 points. Chakolis will soon be joining a former Hopkins teammate at Hampton University next year after signing with the women's basketball program. Ashley Bates, now a sophomore with the Pirates, helped introduce Chakolis to the program based in Hampton, Virginia. "She got me connected with them, and they've been recruiting me since ninth grade," she said. While Tuesday's game might have been important for those following the Minnesota State High School League, players on both squads had other motivations as well. For many, the rivalry carries over into AAU basketball. "This was a real personal one for some of my teammates," said Chakolis, who has played for the Minnesota Stars AAU team. "AAU rivalry, we come in a go hard." 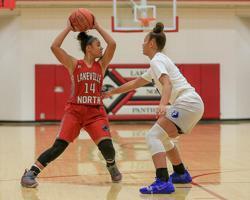 Lakeville North's Analiese Tschida led her team with 19 points Tuesday, and Sarah Kuma finished with 10. On Saturday, the Panthers face St. Michael-Albertville at the Hopkins Tip-Off Classic. Although graduation is on the horizon for Chakolis and some of her teammates, they have one big goal in mind before the end of the season: After finishing runners-up in three consecutive Class 4A state tournaments, the Royals are determined to leave it all on the court come playoff time. "This year is important because it's my senior year, I want to send a message to the other teams and let the little kids know you all have got to step it up when I'm gone," Chakolis said. 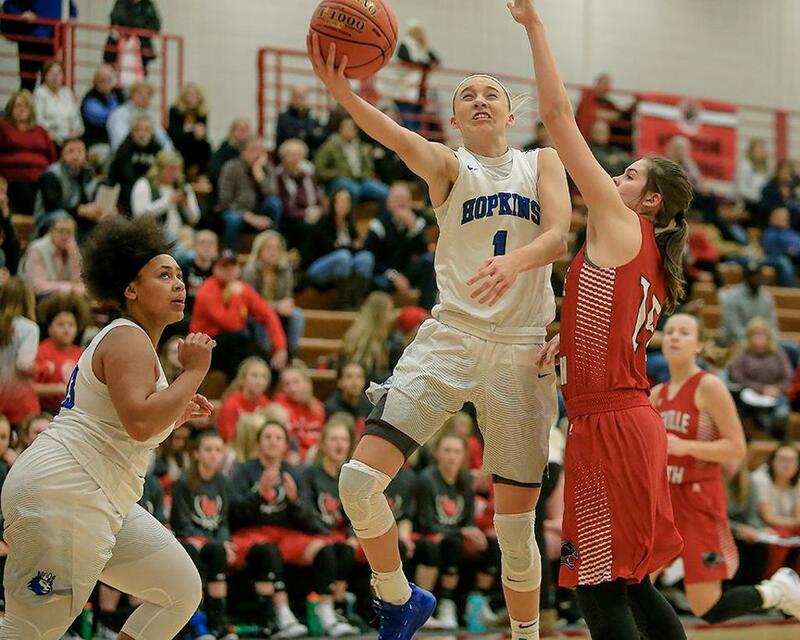 Paige Bueckers and the Hopkins girls' basketball team have a loaded schedule this week with multiple opponents from last year's Class 4A state tournament. But it didn't seem to phase them on Tuesday in an 83-41 win at Lakeville North (0-1). Bueckers finished with 26 points and added seven rebounds while her teammate Dlayla Chakolis scored 22 points as the Royals led by 32 points at halftime. Maya Nnaji added 10 points. 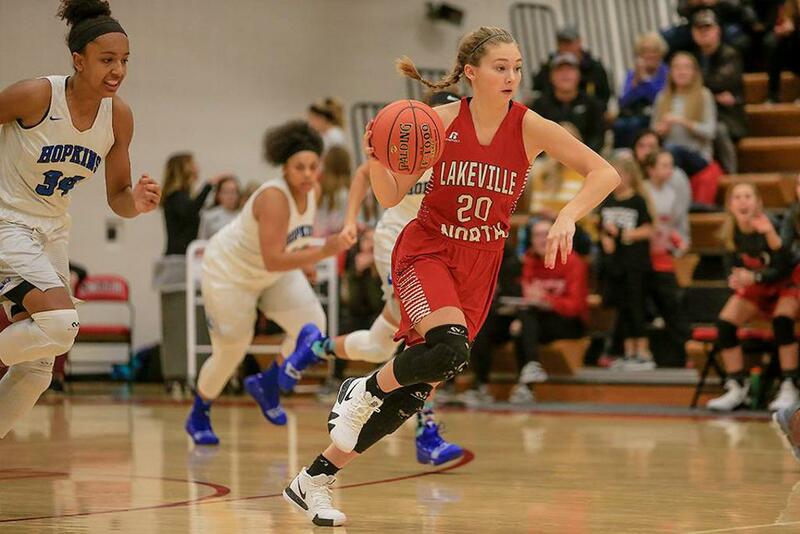 Lakeville North's Analiese Tschida led the Panthers with 19 points, and Sarah Kuma finished with 10. Hopkins (3-0) will next play Eastview at home on Saturday in a rematch of last year's Class 4A state championship game. The MN Girls' Basketball Hub poll is for entertainment purposes only.